I’ve never been without flowering bulbs in my herb garden. 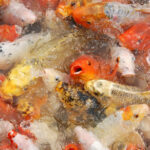 Lilies, tulips, crocus, and daffodils that emerge in the spring are a delight to the soul. They’re easy to plant and come back year after year. The problem is keeping track of where you planted them so they’re not accidentally dug up during the dormant period. The standard garden advice is to put a marker in the soil to remind you where the bulbs are hidden. Sounds great but frankly this doesn’t work. Why? 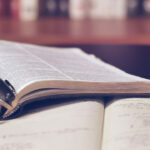 Because it is so, so easy for that marker to move, break and disappear. Then we all know the sad tale that follows. You’re out in the garden adding plants into the bed. The shovel goes in the soil and comes out with a neatly sliced half of a daffodil bulb. Aargh! 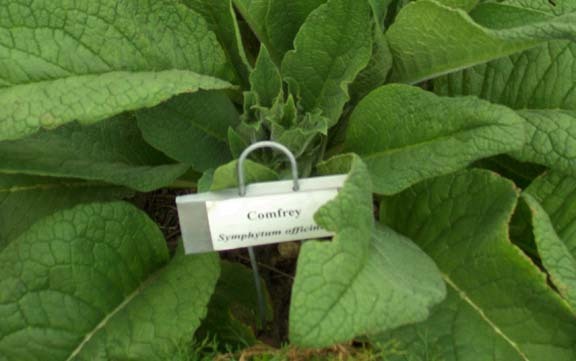 The sign on this comfrey is made of metal and has a chance of surviving in the garden. But most of us use popsicle sticks or other wooden signs to mark where we put our bulbs. These are far more likely to break or disappear. So what’s the solution? After you’ve buried your spring flowering bulbs, plant some low growing perennial herbs on top. The relatively shallow roots of the herbs won’t interfere with the bulbs. In spring stalks from the daffodils and other beauties emerge easily through the herb foliage. Then when the daffodils and snowdrops have died down you have the perennial herb marking the spot so you don’t accidentally dig up the dormant bulbs. A win-win all the way around. 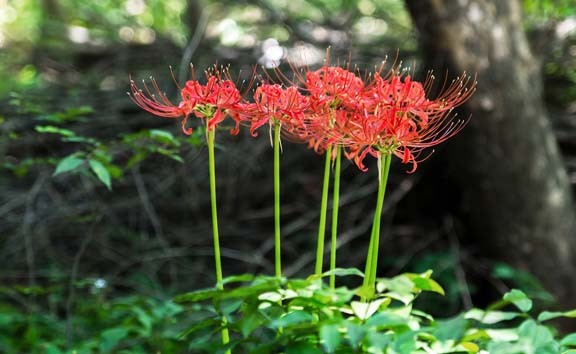 Red spider lilies will grow and come back year after year in many areas of the Southwest. These pair nicely with low-growing herbs such as thyme. Don’t make the mistake of accidentally slicing your spring bulbs in half. Plant one of these six herbs on top of your bulbs for a more permanent marker. Pennyroyal, a creeping mint with small glossy leaves and a slightly medicinal scent. Thyme, the perfect plant for ground cover in any garden. Soapwort, another handy ground cover that will grow in sun or shade. Sweet woodruff, grown for its vanilla scented leaves and delicate white flowers. Corsican mint, a prostrate mint with tiny leaves and equally tiny lavender flowers. Winter savory, the perfect herb for soup lovers. Every southwest garden should have some rain lilies like this tucked way in a spot near the door of your home. 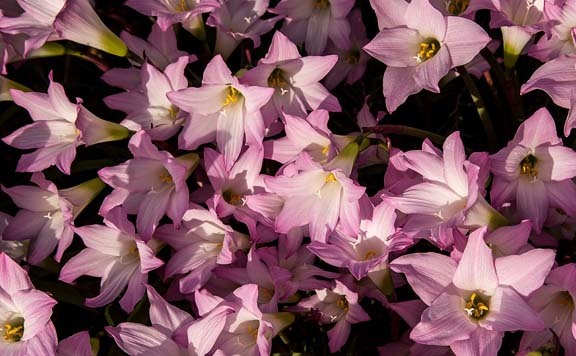 They are called rain lilies because the flowers pop up anytime there is a heavy period of rain. I just love having them in my front garden!